A new study has demonstrated just how much dogs rely on seeing their owners faces in order to recognize them. The study, titled "Selective attention to humans in companion dogs, Canis familiaris", is to be published in an upcoming issue of the journal Animal Behavior. The research team, led by Paolo Mongillo from the University of Padua in Italy, discovered that dogs found great difficulty in recognizing their owner when they had their face covered, and that they prefer to look at their owner than a stranger. In the experiment, dogs were exposed to their owner and an unfamiliar person entering the room and leaving through different doors. At the end of the test, the dogs were allowed to approach the doors. The researchers measured the average length of time the dog's visual orientation was aimed towards the different targets. Dogs gave preferential attention to their owner, and specifically spent much more time gazing at the door through which their owner left the room. The researchers repeated the experiments when the head of the people entering and leaving was not visible. In these experiments, the amount of time spent watching their owner and the door through which they left the room decreased significantly. "Most of the dogs gazed at their owners for most of the time and then chose to wait by the owner's door. If you imagine a dog in a real setting in a city or anywhere in the middle of a crowd or a crowded space, you can see how the animal must have adapted to give preferential attention to its owner," Dr Mongillo told the BBC. He described how this behavior was entirely expected, but that it had simply never been definitively measured before. Perhaps the most interesting implication of the study is how dogs have adapted to live with humans. In wild dog packs, individual members rely on body signals and scent from other animals in their social group, but this study suggests that domestic dogs have adapted to rely on other cues when living with humans, since their human owners are not able to communicate through canine body language. On a dark and stormy night as the thunder rolls in, do you find your dog cowering under the table? You’re not alone! Fear of loud noises, including thunder, is a common issue with dogs. Your pup can develop sound sensitivities between the ages of two and four, and they tend to get worse with age. Dogs that are afraid of thunder usually are triggered by some external force. They can sense that a storm is coming by the increasing wind or even the darkening sky. The American Kennel Club® offers the following tips on how to calm your dog’s fears. * Try a desensitization program. Get a tape recording of the sound of thunder and introduce the noise at a very low level, gradually increasing the volume and giving praise when your pooch does not run and hide from the noise. This does require a great deal of time and patience on your part. * Divert your dog’s attention from the noise by playing a fun game with her at the right moments to turn the bad triggers into positive ones. * See if your pup will eat her favorite treats during the storm. If she does, then giving her one will help keep her engaged when the thunder strikes. * Your veterinarian may suggest treating your dog with tranquilizers or herbal mixtures before a storm approaches. Sometimes these work, but they are not guarantees. Additional information on caring for your dog can be found on the AKC website at www.akc.org. I talk about the FURminator Dog deShedding Tool multiple times on this blog and always promise to do a review but never get the time to do said review. Many of you have also e-mailed asking questions about the FURminator dog deShedding tool, so I have FINALLY made some time to let you know what I think of this product. If you’re a Labrador Retriever owner, chances are there is evidence of your Labrador Retriever all over your home in the form of dog hair. Usually, this is something that is to be expected. Just as we humans lose or “shed” our hair on a daily basis, our animal friends shed their fur as well. The problem here is when we own particularly furry pets who will leave gobs upon gobs of hair all over the place. Enter the FURminator. A de-shedding tool that promises to greatly reduce the amount of fur being left around your home. Just what is this tool and how does it work? The FURminator is, as previously stated, a de-shedding tool that looks like a lot of the other brushes or blades that are out there on the market. This product, though, reaches down into the undercoat to grab loose fur while nicely grooming the top coat. It is also designed to work on most any shedding breed of dog or cat; as long as they have fur, of course. 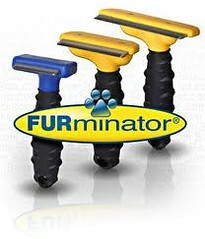 With its stainless steel head and ergonomic handle, the FURminator will reduce your dog’s - or even your cat’s - shedding for approximately four to six weeks. • Do not use this de-shedding tool on puppies or kittens. They are brand new and their coats are just growing in for the first time. Just as you wouldn’t use thinning shears on a baby’s hair, don’t use the FURminator on a puppy or kitten. • Ensure your Labrador Retriever (or other dog you may have) has been properly bathed prior to using the FURminator. Don’t think that you can use this whenever and wherever. If your pet is still wet from a bath, wait until they are dry. Also ensure you’ve run a grooming brush through their hair first. Your hair stylist wouldn’t cut your hair without first combing it out - and you shouldn’t try to de-shed your pet before detangling their fur. • Have a good bathing routine in place. We shower daily to keep clean and to slough off dead skin cells so that our skin stays healthy. Even in a home without pets, there will be hair in your shower drain. The same is true of caring for furry pets. Your shedding issues may not, in fact, be shedding issues at all and may simply be rooted in lack of a bathing routine. • Do not use this product every day. It’s very easy to overuse de-shedding tools, especially if it doesn’t seem as though you’re getting instant results. You have a Labrador Retriever in your home - there is going to be fur around. What you’re looking for by using a de-shedding tool is to simply decrease the amount of fur. As long as you keep those things in mind and are already caring for your Labrador Retriever's coat on a regular basis, we think you’ll find that the FURminator is an incredibly handy product that will certainly help to reduce your Labrador Retriever's shedding quickly, efficiently, and gently. Disclaimer: The FURminator dog deShedding tool was purchase out of my own pocket, with my own money. The opinions within this post are of my own. I was not compensated by anyone, as I bought the FURminator dog deShedding tool with my own money and for my own use. My reviews may not always positive, but they are my personal and honest opinions. Please conduct your own research before purchasing products (I'm not sure I even need this disclaimer for products that I purchase with my own money, but with new disclaimer rules, it doesn't hurt to post one). This beautiful yellow Labrador Retriever loves to swim, but it's who he loves to swim with that may surprise you. Over in the Tory Island Harbour, Ireland, a yellow Labrador Retriever name Ben and a dolphin named Dougie have struck up a friendship. According to the video, Dougie and Ben can be seen swimming together daily. I love how Ben runs down the ramp to the water and swim out to Dougie. Duggie and Ben also entertain recent arrivals at the pier on Tory Island, Donegal. It's also reported to be a regular occurrence as they greet the tourists and locals arriving on the Tormór ferry from Magheroarty. Free sample of K9 FullFlex Hip & Joint Formula. Give Your Dog Relief From Joint Pain. "Dog joint pain is typically caused by the wear and tear of aging joints when the deterioration of cartilage starts allowing painful bone-to-bone contact to occur. K9 FullFlex™ is a revolutionary new canine joint care product that contains the most potent organic, American-sourced ingredients available today that have been proven to reduce discomfort, strengthen connective tissue and enhance the bone and joint integrity in senior dogs." Request your Free Sample of K9 FullFlex. The Free K9 FullFlex sample offer only applies to the USA and Canada. They are not able to ship to Texas. I recently received a wonderful new product to review from the wonderful people at Dog Time Media, called Ewww Pawsitively Clean by Bissell. As the readers of All About Labradors know, I have two beautiful Labrador Retrievers who are the best dogs in the world, BUT they can get messy and smelly every now and then. So giving the Ewww Pawsitively Clean by Bissell product a chance to work on some of their things (and my carpet) wouldn't be a problem. I decided first to give Ewww Pawsitively Clean by Bissell a try on my carpet where my two Labrador girls occasionally visit. After spraying Ewww Pawsitively Clean on my carpet, I was pleasantly surprised with the fresh smell it left on my carpet, completely removing any "DOG SMELL" that was previously there. Their product states that powerful enzyme-action tackles deep down stains and odors, while fast acting cleaning and deodorizing agents start working immediately. I couldn't agree more as my carpet looked and smelled fantastic! 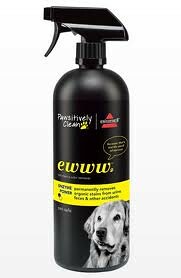 The second item I decided to try Ewww Pawsitively Clean by Bissell on was my Labrador Retriever beds. A stain here and there, an occasion doggy accident and the ever present dog ordor, their dog beds would be an outstanding place to give Ewww Pawsitively Clean a try. Once again, Ewww Pawsitively Clean came through with flying colors. Any stains that were present were removed, with a wonderful clean, fresh fragrance in their beds. The Ewww Pawsitively Clean by Bissell will also be very useful for daily spraying of their beds between full hand washings. Safe for use on carpets, upholstery, pet beds, litter boxes or any water-safe surface, Ewww Pawsitively Clean by Bissell permanently removes organic stains from urine, feces and other accidents. Disclaimer: I would like to thank Dog Time Media on behalf of Bissell for the opportunity to review Ewww Pawsitively Clean. The opinions within this post are of my own and I was not influenced in any way. I was not compensated in any manner, other than the free bottle of Ewww Pawsitively Clean by Bissell to review. My reviews may not always positive, but they are my personal and honest opinions. Please conduct your own research before purchasing products. Halloween is a wonderful happy time for the kids and family but can be a very stressful holiday for your Labrador Retriever or other dogs in your family. Learn how to keep your Labrador Retriever or other family dog safe, happy and healthy with the following Halloween dog safety tip videos. Eric covers costume safety for your dog, candle and Jack O lantern safety, chocolate and candy wrappers and leaving your dog outside on Halloween. We love the wonderful introduction with Friday the Thirteenth music player and Eric dressed as Jason! Patrick Louge of Bark Busters covers flammables and edibles, costumes, safe areas and trick or treating with your dog. Christine and Vicki of the The Pampered Pooch will share some safety tips for your pets at Halloween. Discussions also include useful reflective products for your dog while out with you at night, tips on purchasing costumes, The Pampered Pooch of the Week, Halloween party planning and some party planning ideas for a "Hollywood/Movie" themed birthday party for your dog. Listen in for a howling good time! Blue Buffalo has issued a recall for its Wilderness Chicken-Dog, Basics Salmon-Dog and Large Breed Adult Dog foods sold under the BLUE brand, because they could contain excessive levels of vitamin D.
At Blue Buffalo, nothing is more important than the health and well being of our dogs and cats, so it’s consistent with this guiding principle that we are voluntarily recalling specific production runs of our Wilderness Chicken-Dog, Basics Salmon-Dog and Large Breed Adult Dog products, as we have reason to believe that the products from these runs may contain a higher level of Vitamin D than is called for in our product specifications. PRLog (Press Release) – Sep 30, 2010 – Make your dog the best dressed this Hallowe’en with their very own ghoul-tastic slogan t-shirt from UrbanPup.com. To design their t-shirt, simply choose a slogan from the UrbanPup.com Hallowe’en library, pick your colour and leave the rest to UrbanPup.com. Or, if you’re feeling creative, you can have your own phrase emblazoned across your pup’s threads. Either way, UrbanPup.com will make your bespoke slogan t-shirt from high quality, fine knit gauge, 100% cotton with a velvety-feel cotton-flock text. Design your own hoodies and harness t-shirts are also available. Contact urbanpup.com for a sample. UrbanPup.com is an online Pet Boutique offering Designer Dog Fashions, Dog Coats, Dog Sweaters & Hoodies, Bling Dog Collars and Harnesses, Dog Accessories, Dog Dresses and Pet Carriers. Back in May of 2009, I had the pleasure to help announce the launch of new stain and odor cleaning products called CLEAN+GREEN® by SeaYu Enterprises. CLEAN+GREEN® are eco-friendly aerosol pet odor and stain remover products, made from organic and biodegradable ingredients and packaged so you can recycle the container. I had great success using their Clean+Green Carpet & Upholstery Odor Eliminator and I highly recommend Clean+Green. If you would like to read our original post review, you can do so by visiting Clean+Green Products. Visit the CLEAN+GREEN® website and tell me what other dog product you would like to try. One Extra Entry if you add All About Labradors to your Blogroll. One Extra Entry if you add a link to this post on your Facebook page. Five Extra Entries if you blog about this giveaway with a link back to this post. Leave a comment on another post besides this one ( leave link to comment ). One extra entry for each comment you leave on another post. This giveaway is open to residents of the United States and Canada, 18 or older and will end at 11:59 PM EST 10/17/10. Three winners will be selected by random generator and the entries verified. The winner will then have 48 hours to claim their giveaway prize. If the winner does not claim their prize within their 48 hour period, a new winner will be chosen. Disclaimer: I would like to thank SeaYu for the opportunity to offer the readers of All About Labradors a chance to win Clean+Green Dog & Cat Carpet & Upholstery cleaner. The opinions within this post are of my own and I was not influenced in any way. I was not compensated in any manner, other than the three cans of Clean+Green Dog & Cat Carpet & Upholstery cleaner to giveaway. My reviews may not always positive, but they are my personal and honest opinions. Please conduct your own research before purchasing products.